Upon my return to SIN in 1999, Peggy Tan (VP to Orchid Society of South East Asia/OSSEA), a friend and classmate from 1962 asked me to help out OSSEA (founded 1928). Was involved with their functions, meetings, shows and the publications of their yearly Malayan Orchid Review/MOR first publication 1931). Have been an orchid admirer since my childhood and still is. Minimum knowledge about them even though a member of OSSEA but learning all the time! 2008 WOC in Miami, FL, USA, OSSEA representing SIN won the bid for the 2011 WOC to be held in SIN which will be just around the corner after 2010’s SIN Orchid Show. Will help whenever in SIN but with my present life style, freelance or part-time help is the best I can do. 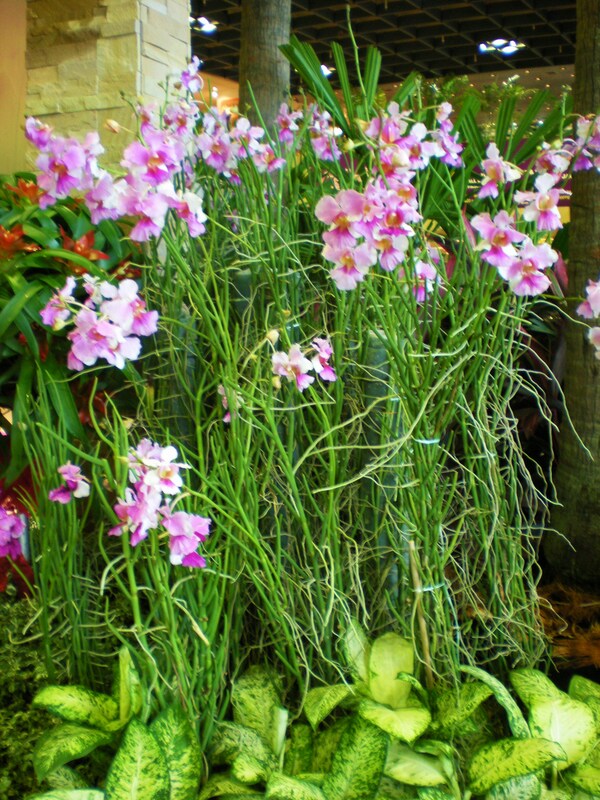 Orchid growers would question about the names and locations of these pictures but for me they are beautiful flowers! Excuse the non-sharpness as they are for my enjoyment and not for MOR printing. The first row (Changi Airport T1): SIN National Flower, Vanda Miss Joaquim (hybrid between P.teres x P.hookeriana). 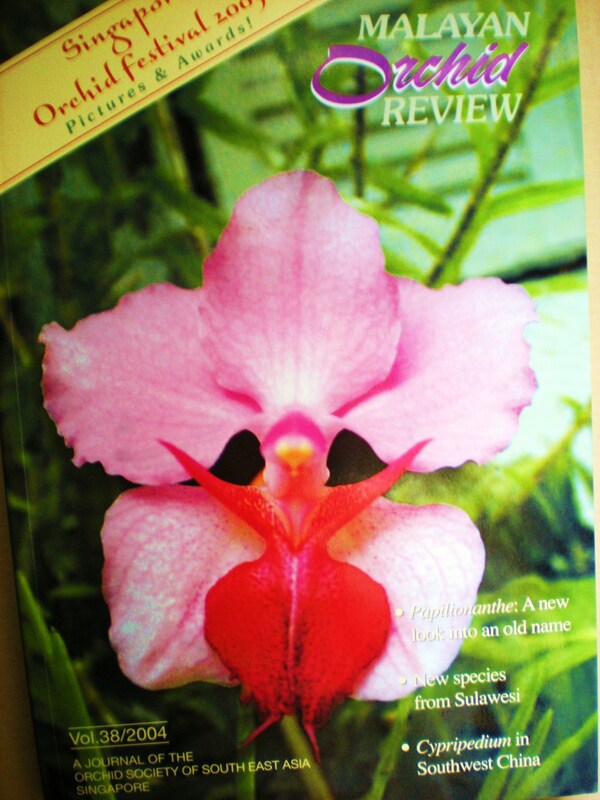 The single orchid is a painting on glass with a water-featured background and 2004 MOR’s cover with P.Amy (P.tricuspidata x P.hookeriana), a rare hybrid. P=Papilionanthe. The other pictures: Grammatophyllum flowering on the heritage tree in SBG. According to the experts, the plant is in the shade and unlikely to flower… thank goodness there are exceptions to the rules! 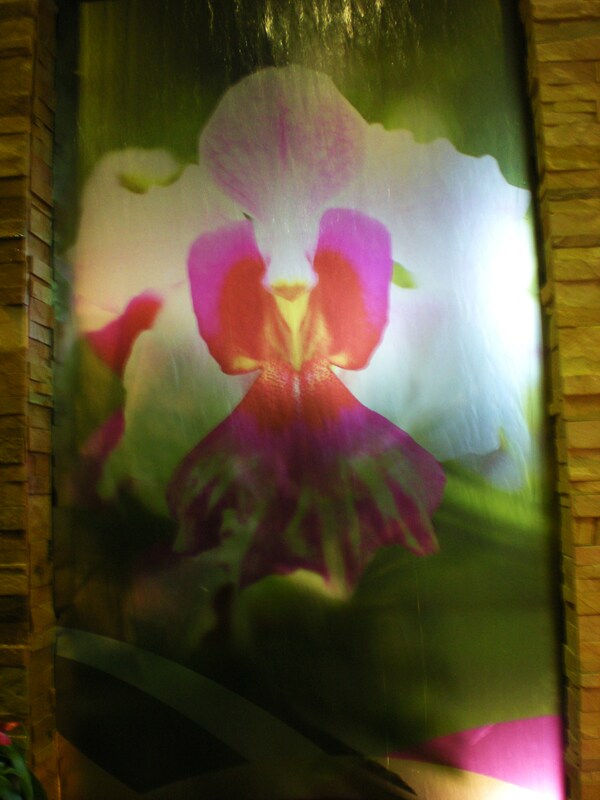 Orchid derives from the Greek word orchis meaning testicle with its history associated with lust, greed and wealth! During the 1800s, they were collected extensively and as many as 4,000 trees were cut down to collect the orchid growing on their branches. One collector alone was believed to have sent 100s of 1,000s to England, where, unfortunately, most died. There are almost 25,000 different types of orchid and some of their reproductive behaviours have been a basis for study amongst botanists for years. Their peculiarity is that for its seed to germinate it needs to be penetrated by fungus threads. The paphiopedilum was named for Phaphos, a temple on Cyprus where the love goddess Aphrodite was worshipped (where prostitutes were said to be readily available). The famous vanilla orchid was said to give strength for the Aztecs who drink vanilla mixed with chocolate… for those who do not know, vanilla is an orchid!